Nick Foles is getting the start on Sunday. The Eagles look to stay perfect Sunday as they head south to take on the Tampa Bay Buccaneers, who are coming off a big 48-40 win over the Saints. Who will win? Our beat writers think it will be a good weekend for the Eagles. So much attention went to the 48 points that the Buccaneers scored on Sunday, and not enough attention has been paid to the 40 points they allowed. That's a welcome sign for an Eagles offense that lacked firepower last week. Add in the injuries in Tampa Bay's secondary, and I expect a better outing from Nick Foles and Co. Even without Alshon Jeffery, the passing game should be more effective. Zach Ertz is better than how he looked against Atlanta, and he should rebound. 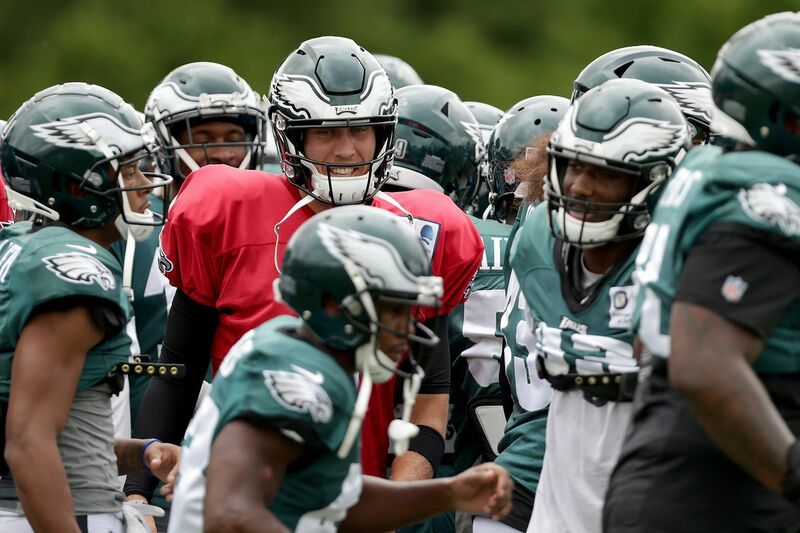 The extra time the Eagles had to prepare – plus a full game to knock off the early-season rust – will be advantageous. The strength of Tampa Bay's defense is the line, but there should be confidence in the Eagles' offensive line. With that said, this won't be an especially high-scoring game. In fact, the over/under is 44, one week after the Bucs played in a game that totaled 88 points. The Bucs' offensive weapons are impressive. Ryan Fitzpatrick hasn't lasted 14 years by accident, although he had a career day Sunday. My guess is the Eagles' defensive line makes it harder for him. The key will be to keep the receivers from big plays. That has been a point of emphasis this week. I expect the Eagles to move to 2-0 with a win. When an offense struggles as much as the Eagles' did in last week's opener, it's hard to go into the next week supremely confident, especially when the coming week's opponent just went into New Orleans and hung a 48-40 upset on the Saints. But New Orleans has started out 0-2 every year since 2014; maybe Tampa Bay will be a big NFL surprise story this season, and maybe it won't. Huge injuries cloud the Bucs' picture. Starting cornerback Vernon Hargreaves is out for the season with a shoulder injury suffered in the opener, while the other corner, Brent Grimes, missed the opener with a groin injury and seems likely to be sidelined again. DeSean Jackson has a shoulder injury and suffered a concussion in New Orleans, though he returned to practice Thursday. Quarterback Ryan Fitzpatrick, who turns 36 in November, has really good weapons, even without Jackson, in Mike Evans and O.J. Howard, but the Saints got no pass-rush pressure and busted their coverages on several Bucs big plays. If Jim Schwartz's defense plays the same way, the Eagles are in trouble. I don't really see that happening. More likely, we'll see a less shaky offensive outing this time with Nick Foles, and the Eagles' defense making the difference. The fact that the Bucs put up 48 points against the Saints was impressive. That said, I don't think it's hide-the-women-and-children time. Yes, quarterback Ryan Fitzpatrick threw for 417 yards and four TDs and has one of the league's better pass-catching arsenals at his disposal, even if concussed ex-Eagle DeSean Jackson isn't cleared to play. But the reason Fitzpatrick was able to throw for a gazillion yards last week was because the Saints didn't get any pressure on him. He had all day to throw and if you can't complete passes to Jackson and Mike Evans when you have all day to throw, you're in the wrong profession. That's not going to happen this week. Fletcher Cox and Co. are going to be in Fitzpatrick's face as often – and probably more – than they were in Matt Ryan's face last week when the Eagles held Ryan to his lowest completion percentage in seven years. That's right. Seven years. Another thing that's not going to happen: Fitzpatrick and the Bucs won't get the plethora of third-and-shorts they got against the Saints. The Eagles will jump out early in this one and probably won't need to ever look back. Prediction: Eagles 31, Bucs 23. The Bucs put up 48 points on what's supposed to be a good Saints team in the opener. In New Orleans. Without starting quarterback Jameis Winston. Tampa has some potent weapons, and backup quarterback Ryan Fitzpatrick has won his share in the NFL, but I can't see the Eagles allowing anywhere near that number of points. They will have to find a way to contain receivers Mike Evans, DeSean Jackson, and Chris Godwin, though. Jackson, who was in concussion protocol, practiced on Thursday. Bucs coach Dirk Koetter isn't afraid to dial up the long ball, and Fitzpatrick isn't afraid to chuck it, especially with big targets like Evans and tight end O.J. Howard and speedy ones like Jackson and Godwin. Still, I think Fletcher Cox and company will generate more pressure than the Saints did. On the other side of the ball, the Bucs lost their top cornerback in Vernon Hargreaves and could also be without Brent Grimes. Defensive end Jason Pierre-Paul is also questionable. Defensive tackle Gerald McCoy is the linchpin of the line. McCoy vs. guard Brandon Brooks could be a heavyweight bout. Former Eagles Vinny Curry and Beau Allen will be familiar faces on that line. The Bucs play a lot of quarters zone, which typically guards against getting beat deep. The Eagles offense was shaky last week, but Nick Foles should have good vibes heading back to Raymond James Stadium. His first NFL victory came there, and he followed up a year later with another win. Doug Pederson will likely try to get the ground game going behind Jay Ajayi. With Alshon Jeffery still out, the receiving group takes on a different look. But Zach Ertz should get back on track, and Nelson Agholor has the ability to explode at a moment's notice.